What Is the Meaning of Human Life on the Planet Earth? We interviewed William Patrick Patterson during his nationwide speaking tour introducing Gurdjieff's Legacy, the concluding installment of his video trilogy. The Gurdjieff Journal: Viewing the sheer scale of the video trilogy of Gurdjieff's life and teachingone that is shot on-site in Egypt, Russia, Turkey, France, London and Americais truly a monumental experience. Just how long has it taken to complete the trilogy The Life and Significance of George Ivanovitch Gurdjieff? William Patrick Patterson: A few lifetimes or a few seconds depending on one's perspective. We began shooting the first video, Gurdjieff in Egypt, December 1996; finished Gurdjieff's Mission in 2002; and completed the third video of the trilogy, Gurdjieff's Legacy, in February 2003. TGJ: Where did the idea come from to do a video? WPP: I was on my way to a meeting in Israel and decided to make a stopover in Egypt. I'd never been much interested in Egypt, believing, as most people do, that Western civilization began with the Greeks. But seeing the Sphinx, the Great Pyramid and then going up the Nile to Thebes, modern-day Luxor, and seeing the Temple of Man, Karnak and the Valley of the Kings ... well, I stood in awe of the immense scale, intelligence and deep esoteric understanding that once existed. TGJ: What impressed you the most? WPP: The whole of it. So to continue ... when I returned to America I reread the chapter in Meetings with Remarkable Men where Mr. Gurdjieff sees the map of pre-sand Egypt. I'd been reading that book for decades and never asked myself the obvious question: what did he see on the map? WPP: The obvious is often what is most hidden. Anyway, Gurdjieff doesn't say directly but later gives the answer about what he saw when he says he had been "spending all my free time walking among these places [the Giza Plateau outside Cairo] like one possessed, hoping to find, with the help of my map of pre-sand Egypt, an explanation of the Sphinx and of certain other monuments of antiquity." Remember now that he is in search of the origin of esoteric knowledge and believes it to be the Sarmoung Brotherhood, which existed in Babylon about 2,500 B.C.E. But in coming upon the map of pre-sand Egypt he immediately breaks off his search and goes where?to the Giza Plateau. TGJ: But why would he need an "explanation of the Sphinx"? WPP: Exactly. The Rosetta Stone had been discovered and deciphered in the 1820s and every Egyptologist of that day (as well as most of this day) believed the Sphinx dated from the time of the Great Pyramid, about 2,750 B.C.E. So why does Gurdjieff need an "explanation"? Well, because that is what he saw on the map! TGJ: Couldn't he have seen something else? WPP: What else? The Sphinx is the primordial symbol of esoteric knowledge. TGJ: Pre-sand Egypt. What are we talking about in terms of time? WPP: The time was 7,500 B.C.E. and before. That was when Egypt was green. Later I came upon a video by John Anthony West, a member of the Gurdjieff Society in England, who believes that the Sphinx dated from pre-sand Egypt. He had read Sacred Science by René Schwaller de Lubicz, the great hermetic Egyptologist, in which de Lubicz says that the erosion we see on the Sphinx is not caused by wind or sand but water. West has done a lot of pioneering and innovative work with geologists to establish the true date of the Sphinx and is still carrying on the struggle. TGJ: With this insight why didn't you write a book rather than do a video? WPP: I've written a number of books so that would not be a challenge. More importantly, I believe, as never before, we need to build bridges to young people, and young people seem to be more influenced by video and film than books. Then, too, I have groups and groups need projects and what better project to jump into than something none of us knew anything about. TGJ: Did you plan a trilogy from the outset? WPP: No, not at all. Creating a video was a many faceted project. Our aim was to meet professional standards so that what we did technically would not take away from the tremendous and unrecognized story we had to tell of Gurdjieff's search in Egypt and Abyssinia. WPP: Yes, most people believe that the origin of The Fourth Way was in Central Asiabasically Sufi or dervish. Either that or Russian Orthodox Christianity. WPP: Let's get into that later. So, as I was saying, we just hoped we could complete the first videowe had no idea of doing a trilogy. But then on completing Gurdjieff in Egypt it just seemed right and necessary to tell the entire story. TGJ: Necessary? Most people know the story don't they? WPP: The film of Meetings with Remarkable Men, as beautiful and compelling as it is in many sections, gave only a part of Gurdjieff's life. James Webb's biography of Gurdjieff shows prodigious research but is fanciful at times and biased throughout. James Moore's biography is much better, but I find his vision conventional and limited and the language too self-referential. TGJ: What about Bennett's Making a New World? WPP: This is his best book in my opinion. But he believes the origin of the teaching is Sufi. 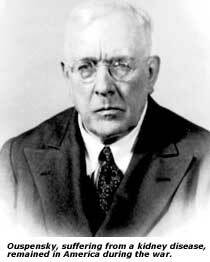 He, like Ouspensky, has had a significant influence on framing the public view of the teaching. Just as Ouspensky believed the teaching was fragmentaryhis view was based solely on the Russian period of the teaching, and when presented with Gurdjieff's Legominism he thought it was rubbishBennett, too, never seems to have realized what Gurdjieff says in Search, that "The teaching whose theory is here being set out is completely self-supporting and independent of other spiritual lines and it has been completely unknown up to the present time." The emphasis is mine. WPP: Bennett was introduced to the teaching three times. In Constantinople in 1921. 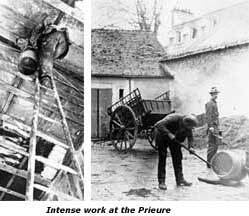 At the Prieuré in 1923. And in Paris in 1948. 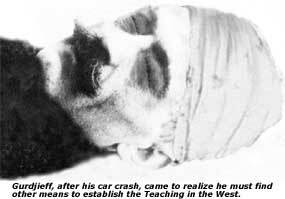 From what Bennett reports in Witness, Gurdjieff had high hopes of Bennett spreading and carrying on the teaching. Instead, Bennett hopped from the Work to Subud to Catholicism to Idries Shah to Hinduism and then into some eclectic combination of all these which he taught and called The Fourth Way. His actions show he never realized that "the teaching . . . is completely self-supporting and independent of other spiritual lines." TGJ: You mean he shouldn't have kept searching? WPP: Like a good many people who enter the Work, he didn't realize the search was over. He had found what he had been searching for. Some people, you know, are perennial seekers. They "collect" teachings and teachers but remain aloof, uncommitted. It's one form of what I call esoteric egoism. TGJ: Let me see if I understand what you're saying. Namely, that Ouspensky's and Bennett's views have largely framed the teachingOuspensky in terms of it being fragmentary and Bennett because he believes it is derivative in originmainly Sufi. Right? WPP: That's good enough for now. TGJ: So what is your viewpoint? WPP: Let me first just clear up another strand of thought. In Search when Gurdjieff is asked "What is the relation of the teaching to Christianity as we know it?" Gurdjieff replies: "I don't know what you know about Christianity"Ouspensky puts the word in italics, noting that Gurdjieff emphasized the word. This indicates that Gurdjieff is speaking of a special form of Christianity. "It would be necessary," he says, "to talk a great deal and to talk for a long time in order to make clear what you understand by this term. But for the benefit of those who know already, I will say that, if you like, this is esoteric Christianity." What does that tell you? TGJ: That the Work is esoteric Christianity. WPP: That's what it told Boris Mouravieff and his latter-day follower Robin Amis. But Gurdjieff is not referring to the Christianity we knowbut the Christianity we don't know. 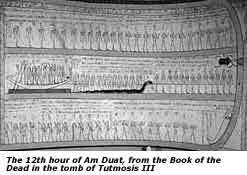 As he says later in Search, "It will seem strange to many people when I say that this prehistoric Egypt was Christian many thousands of years before the birth of Christ, that is to say, that its religion was composed of the same principles and ideas that constitute true Christianity." So the esoteric Christianity Gurdjieff is referring to is a Christianity that existed before the birth of Christ and before the ancient Egyptian religion as we know itthat is, a prehistoric Christianity. TGJ: That really is a revolutionary statement. WPP: Yes. And what it means is that the Fourth Way predates all the religions we know. Thinking in a linear way, just because Gurdjieff introduced the teaching in St. Petersburg in 1912, people have thought that Sufism, the Cabala, and so forth have all predated the Fourth Way. But it's just the reverse. As Gurdjieff says, we see the world topsy-turvy. We go into all this in detail in Gurdjieff in Egypt. TGJ: Was there any overriding structure you followed? WPP: The trilogy runs on three tracks. The first is the historical, the second is the people in Gurdjieff's life, and the third is the major tenets of the teaching. TGJ: So the trilogy tells the history of the Work, as well as giving the major aspects of the teaching? WPP: Yes, but the history and its interpretation differ at points from what is conventionally presumed. TGJ: What do you mean by that? WPP: Many of Gurdjieff's students who wrote about him, and certainly all of his critics, speak from their point of view. Everyone levels him to fit their ideas and beliefs. No one speaks of his missionthat he came to give humanity a teaching that would save it from destroying itself. Everyone seems to unconsciously think he came to awaken and liberate them. I wanted to give the point of view that is rarely recognizedGurdjieff's. TGJ: Isn't that a bit presumptuous? WPP: Of course. And his view can't really be known. But by carefully considering his mission, what he says and how he lived, I think we can shine a needed light on his life and teaching and clear up some misconceptions. WPP: Once he rediscovered the fundamental ideas and principles of the teaching in Upper Egypt and Abyssinia he realized that over time elements of the teaching had drifted northward. So he made a series of journeys to the Hindu Kush, Siberia and Tibet to collect these elements. He then reformulated the teaching for modern times and brought it to the West. As mentioned previously, the teaching, paradoxically, is as old as it is new. TGJ: Why did he want to bring the teaching to the West? Why didn't he just stay where he was and introduce the teaching there? WPP: He realized that humanity was approaching a crucial shock point in its history. As he says, "Unless the 'wisdom' of the East and the 'energy' of the West are harnessed and used harmoniously the world will destroy itself." WPP: Yes, but who took that warning seriously? Now, given 9/11, it's a different world, no? He saw that the West was where the power was. So in 1911 he took a 21-year vow to live an artificial life in order to introduce and establish the teaching in the West. The second video of the trilogy, Gurdjieff's Mission, begins with his coming to St. Petersburg in 1912, then to Moscow, on to Constantinople, France, England and America. We followed his path, shooting all the way. TGJ: Why did he go to St. Petersburg? WPP: I assume because it was the most cosmopolitan city in Russia, right on the edge of Europe. He was fluent in Russian, knew the customs and had friends there. His plan was to form groups, then establish the Institute for the Harmonious Development of Man, train helper-instructors who would disseminate the teaching to the major capitals of the world. He had brought with him a million rubles, two collections of Chinese cloisonné and many rare carpets. TGJ: Why so much money? WPP: As he says in Meetings, he wanted to be dependent on no one. But let me continue. The plan was on schedule until 1917 and the shock of the Russian Revolution. It drove him to Tiflis in the Caucasus where he tried to again set up the Institute. But the uncertainty of the times and governmental red tape made it impossible. So he left for Constantinople where he again opened and closed the Institutethe city was flooded with refugees and a secular movement was coming to the fore. Now what to do? TGJ: Why didn't he go to Greece? He was part Greek, knew the language and so forth? WPP: The power that will determine the fate of the world lies in Europe and America. 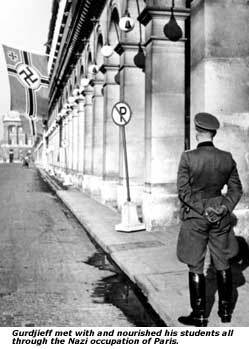 So, though he didn't speak the languages, know the customs, had no friends and little moneyhis million Russian rubles were virtually worthlessGurdjieff stepped off into the future. In 1921, he left for Europe and a year later opened his Institute in France. TGJ: When you shot in Russia and Constantinople did you come upon anything interesting in terms of the Work? WPP: In St. Petersburg we found the streetPushkin Streetwhere Gurdjieff lived, the apartment on Liteiny Street where Ouspensky lived and The Stray Dog café, a haunt of Ouspensky and the intelligentsia and the art world. It was closed by authorities in 1915 and had just reopened several months before we arrived. TGJ: What about the restaurant where Thomas de Hartmann met Gurdjieff? WPP: Yes, we found that but it's a gambling casino now, so we didn't shoot it. In Constantinople we stayed in the Pera district, the European quarter, and found Yemenici Street and the townhouse where Gurdjieff set up the Institute. 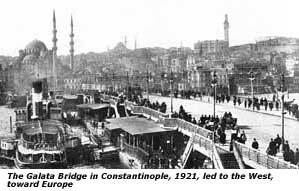 Of course we shot that, as well as the Galata Bridge, the street life and the train station from which Gurdjieff left for Europe. TGJ: You say a second track of the videos is Gurdjieff's students. WPP: Yes, we show the real reasons why Ouspensky left Gurdjieff. They were not the ones he speaks of in Search. 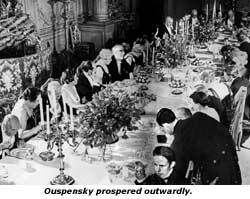 And we follow their relationship through the years from Ouspensky's final break with him in 1924, the final meeting in 1931, and then what befell Ouspensky at the end of his life. 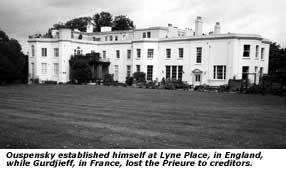 We shot at his estatesLyne Place in England and Mendham in Americaand his grave site. WPP: This was a much more intricate relationship. Jesse Dwight played a larger part than is generally thought. In short, Orage wanted his woman and the teaching, too. Also, Gurdjieff put a lot of pressure on him in terms of money. 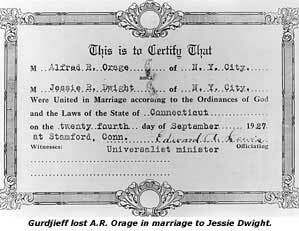 Orage never seemed to realizeat least he never saidthat Gurdjieff used money as a teaching device. Gurdjieff saw how fixated Westerners are about "making dollars" and used it. Remember, he came to Russia with a million rubles, all of which he had earned himself. Obviously, he didn't want money to be a factor. TGJ: Going back to the origin of the teaching for a moment ... what's the proof that the teaching comes from prehistoric Egypt? WPP: No proof other than what Gurdjieff says. Do we believe him or not? If we don't, why are we following someone who we don't believe? I could speak for a long time on all the facts that point to the origin of the Fourth Way being in prehistoric Egypt, but let me just say this: the question is what came firstsacred science or religion? 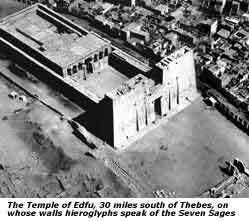 If you go to the Temple of Edfu, about 30 miles up the Nile from Thebes, you find that its walls, which date back to the Pyramid Age, speak of Seven Sages who came from the Homeland of the Primeval Ones, an island that sank during a catastrophic flood. The Seven Sages introduced a high civilization and religion to Egypt. This is a perfect match with what Gurdjieff says in the First Series. If we look at Egyptian religion, which I hold sprang from the Fourth Way, we see its focus was on Being and self-transformation and immortality. The Egyptians believed you have to make a soul and there was no differentiation between the spiritual and the not spiritual. All was spiritual, especially if there was self-remembering. TGJ: But the Egyptian religion devolved into animal worship, didn't it? WPP: Yes. 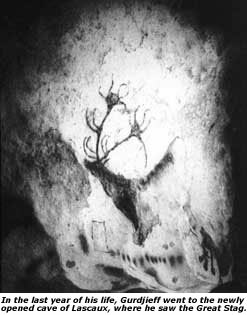 Originally, animals were chosen to depict certain attributes of Being. But then, as you say, it devolved. That was why when Judaism occurred about 1,100 B.C.E., they banned all images. And Judaism doesn't believe in an afterlife. But then, over time, it rigidified into some 500-plus laws that dictated all human behavior. And, of course, they had the idea of "the chosen people." As Gurdjieff said, "Moses told them that, not God." TGJ: Christianity believes in an afterlife. WPP: Yes, and so does Islam. In the past, as Gurdjieff said, real religion consisted of two parts. One part taught what is to be donethat's the exterior part. And the other part taught how to do what the first part teachesthat's the esoteric part. When the esoteric part is lost then religion devolves as it unfortunately has today. It becomes all words, prohibitions and self-calming, which then rigidifies into orthodoxy and fundamentalism. TGJ: That seems to be what we see today. WPP: Exactly. Religion, in my opinion, is on its deathbed. After the current quagmire in the Middle East ends people will ask what was the root cause of the conflict. The answer will be fundamentalismChristian, Jewish, Moslem. With that the new world belief becomes scientific materialism. TGJ: Isn't it already here? WPP: The foundations are already in place. A general de facto declaration is just awaiting the demise of modern religions. TGJ: What will happen to the Work? WPP: In my view it can easily make the transition because it's a sacred science. It can accept much of scientific materialism and be accepted by it. Most important, it can provide the necessary scale and the teaching and practices to move beyond a strict and limited scientific worldview. TGJ: What will it take for that to happen? WPP: Whether the Work makes the transition depends on how it responds and positions itself. That is the impetus for the trilogy. Gurdjieff bequeathed to us a great legacy in terms of his Legominism All and Everything, his music, movements and sacred dances, and exercises. It's for us to commit ourselves to it, make it live. That's the point of the third video Gurdjieff's Legacy. TGJ: Well, that's a lot to think about. TGJ: Is this the first trilogy ever done on Gurdjieff and the teaching? WPP: Yes, Gurdjieff in Egypt is the first video ever made about his search. And Gurdjieff's Mission and Gurdjieff's Legacy are the first to cover the rest of his life. So the trilogy is a perfect complement to the film, Meetings. TGJ: What else do you consider important? WPP: What is important is that the trilogy is a Work project of seven years duration. We didn't do it as a commercial venture. It was our tribute to Mr. Gurdjieff and his teaching. TGJ: Well, as a Work project it was certainly better than digging a ditch. WPP: No, not at all. To act with intention and not for any personal reward but for our Being is the one real value. The making of a trilogy was simply more demanding and complex and ran into years, not hours. TGJ: Were you surprised that each of the videos won a Gold Award at WorldFest? WPP: Absolutely! That each won a Gold Award at such a prestigious international film festival was more than any of us conceived. And that the last two videos won Gold Special Jury Awards for Outstanding Excellence ... well, for that one has to have a great deal of help, and we did. TGJ: What kind of help? WPP: What number Man do you take Mr. Gurdjieff to be? If the ideas and perspectives you've found in this article are of interest, please subscribe to The Gurdjieff Journal. We promise you four lively, provocative issues of the only international journal devoted to exploring self-transformation in the contemporary world and the teaching of G. I. Gurdjieff. The Gurdjieff Journal publishes interviews, book excerpts, essays and book reviews. It does not, and will not, carry advertising. For its publication, it relies solely on the support of its readership.